*sigh* My husband's friend works for a Labrador Rescue group. He called us last evening to see if we wouldn't mind caring for a stray for the weekend. As you know I have 2 beagles so integrating another dog into the fold made me nervous. My smaller dog had issues because he has a bit of Napoleon Complex, otherwise every one is fine and content. Well as long as I don't pay Foster too much attention, God when did my pooches become such Drama Queens? 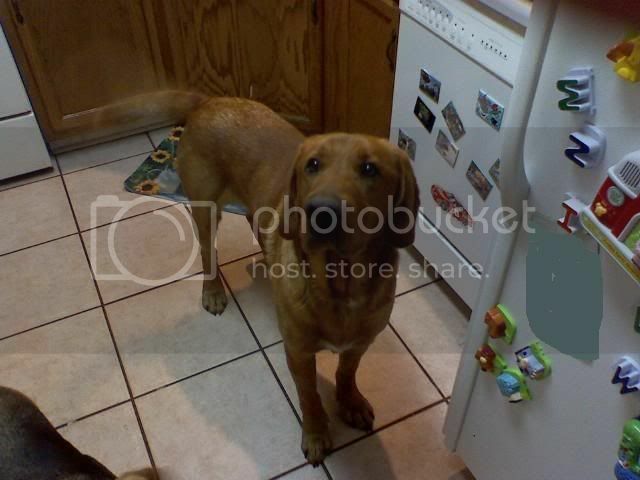 So Meet Foster, he is about 3 years old and a yellow lab/Bloodhound mix. He follows me around obsessively. Thanks, he is very sweet, he's just huge, like 75 pounds. I am such a sucker for animals. I told my husband that if I had a bigger yard we would have at least 5 dogs. My house is just too small for 2 cats and 3 dogs. Foster's face KILLS me, he has those sweet bloodhound eyes that pierce your soul. We're hoping that his family will post fliers soon so we can take him back to his home. OMG!He is so cute! !Actually we have a puppy here for a couple of weeks,unfortunately she doesn't have a nose but she is really cute and not in pain.But she is too naughty and wants to play with the other two but they just ignore her lol. Oh man, his eyes just kill me. Does he have a home waiting for him after the weekend? If I knew someone who could take him I'd say so. But everyone I know is already loaded up with pets. Dude, if i was in the states, I would have taken him! Your voice is so how I imagined it to be. You are the most adorable woman ever!!!! Awww!!! He is gorgeous!! I absolutely LOVE dogs, labs a bit more than most, I have a golden (well she is more white than golden) her in my icon as a puppy. If I didn't live on another continent, I would be there like a shot to bring him home with me. I had labs growing up, my dogs are the first non-labs I've ever owned. I have 2 cats and they are like "WTF" even though I have 2 other dogs. He's a doll, he really is. Thank you, he has captured my heart already. awwwwwwwwwwwwwwwwwwwwwwwwwwwwwww. Hugh Laurie has a lab too, BTW.